As a homebrewer who bottles I sometimes feel like I run a bottle re-purposing factory. Between the rinse after pouring, the cleaning, removal of any labels, the sanitizing, and then bottling all over again, it can seem like a lot of work. There is an ever growing corner in the pantry stacked with cases of empty bottles, some rinsed only and some cleaned. And some end up in the recycle bin to be picked up and actually recycled. A key element to remember during all points along this bottle re-purposing process is to examine the bottles. Look for any flaws and if spotted, send the bottle straight to the recycling bin. I noticed these cracks on the bottle while cleaning. While the glass is fairly strong, the bottle goes through some tough times during the cycle. 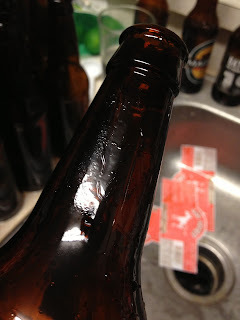 After bottled with fresh beer, there is an increasing amount of pressure build up inside the bottle. And then it goes from room temperature to refrigerator temperature, again altering the pressure some, but definitely introducing a change in temperature. Then it gets opened, poured and then ideally rinsed right away and put aside for storage until ready for future use. All of these changes cause stress to the glass, if even in small ways. Why would we need to examine the bottles? In short, they will become damaged. I've accidentally chipped the top of a bottle while bottling. I'm glad I noticed and scrapped it, as it would have never held any pressure. I've seen bottles that form little cracks in the neck and around the top. This may be nothing at first, but it is definitely the start of a degradation which won't result well. The bottles won't last forever, use after use after use....after use. So, while going through the process, examine each bottle. When you see a crack or other developing flaw, pitch it to the recycling bin. It will save trouble.